DATRI is a non-profit organization that volunteers unrelated donors who have taken the first step to save a life. Funding for DATRI is required to support HLA typing cost incurred by a patient. In case you cannot register as a donor for some reason, you still can support our lifesaving cause with a money donation which will be exempted of tax under 80G. Each registration costs ₹ 1800. Not all donors may have the capacity to bear this cost. You could sponsor such donors and contribute towards gifting lives. You Can Gift A Life. We need help to raise funds for adding donors to the registry, and to cover the operational costs. Please leave a message if you think you can help in raising money through Corporate Social Responsibility initiatives and other means. 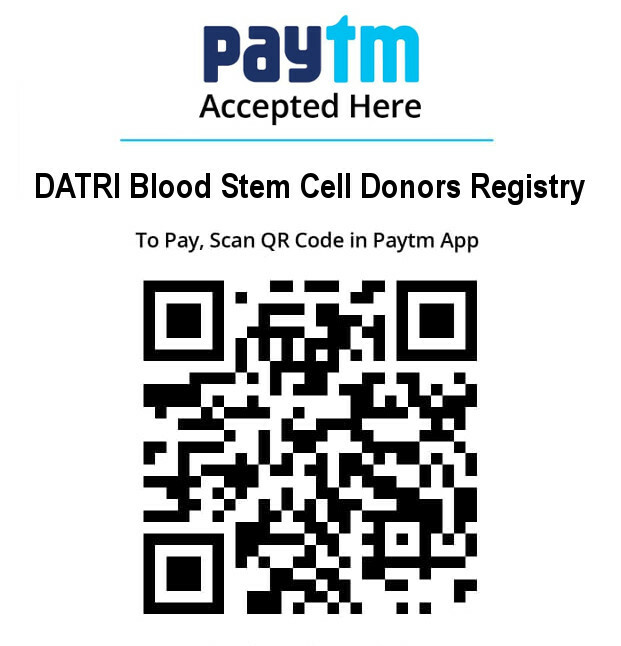 In favour of “DATRI Blood Stem Cell Donors Registry” payable at Chennai. 3. Paytm (scan Paytm code). You have the power to make a difference in the lives of patients and donors. At DATRI, there is a role to suit everyone; from creating awareness, raising money, inspiring people to join our registry and supporting at donor drives and events. WE CAN DO IT ONLY WITH YOUR SUPPORT. Join along with thousands of volunteers who selflessly give their time, talent, and effort to support our life-saving mission. A DATRI co-ordinator will train you. How did you come to know about DATRI?